Achinoam Nini quits Israeli Union of Performing Artists after it awards a legendary right-wing musician its lifetime achievement award. 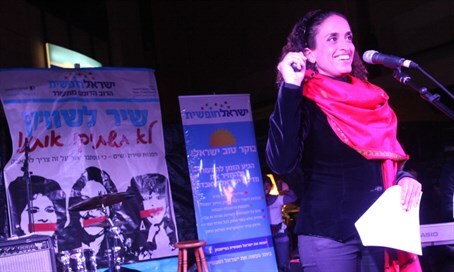 Leftist singer Achinoam Nini announced Sunday her intention to quit the Israeli Union of Performing Artists (IUPA) following its decision to honor singer and composer Ariel Zilber with a lifetime achievement award. "During this blacker than black period, in which books are banned, "blacklists" are published (sound familiar? ), a period filled with violence, racism and hatred, in which signs of fascism are lifting their ugly heads every day, the IUPA decide to present a lifetime achievement award (no, no for the music, not the person's life, there is a difference...to a man who used his great talents to promote the same agenda: violence, racism, hatred (no, this is not a political opinion! there is a difference," Nini wrote on Facebook. "Out of all the artists in Israel proper, they chose this 'artist' of Israel to award the prize too now?? And in what name, I ask? And for what? What is the message this organization seeks to send to the nation," she continued. "And even more so after Dalia Rabin (yes her, not me) asked the ACUM, who wanted to present Zilber its lifetime achievement award for his music a year and a half ago, to change their choice out of respect for her father, whose murder Zilber supports?? So the IUPA will show her, right? Me too!! I'll show everyoneeee (sic)!!" It should be noted that Zilber never supported Rabin's murder. At one point he was said to have supported parole for Yigal Amir, but denied having said that as well. "I see this as an act of servility, cowardice, an embarrassing apologist attempt to prove our existence as non-racist - one that is jaded and blind," Nini blasted. "It's a disgrace, it's revolting," she continued. "I'm not going to continue to belong to this wretched establishment. Let it go on without me on all fours licking force and brute-force, lowering itself to the ground and wallowing in it." Zilber in early 2014 was due to win a lifetime achievement prize from ACUM (Union of Composers, Writers and Publishers in Israeli Music), but the prize was shot down by leftists. Nini announced at the time that she would not accept a prize from ACUM so long as Zilber was being honored as well. At the last moment ACUM chose to change the award from a lifetime achievement award to a "contribution to music" prize, under pressure from Dalia Rabin, daughter of assassinated Prime Minister Yitzhak Rabin. Rabin, a member of ACUM’s board of directors, like Nini expressed fierce opposition to Zilber because of his right-wing religious political stance.